Beinn a'Chleibh seems, normally, to be climbed together with Ben Lui, as there's little additionally height gain needed to "bag" both mountains. 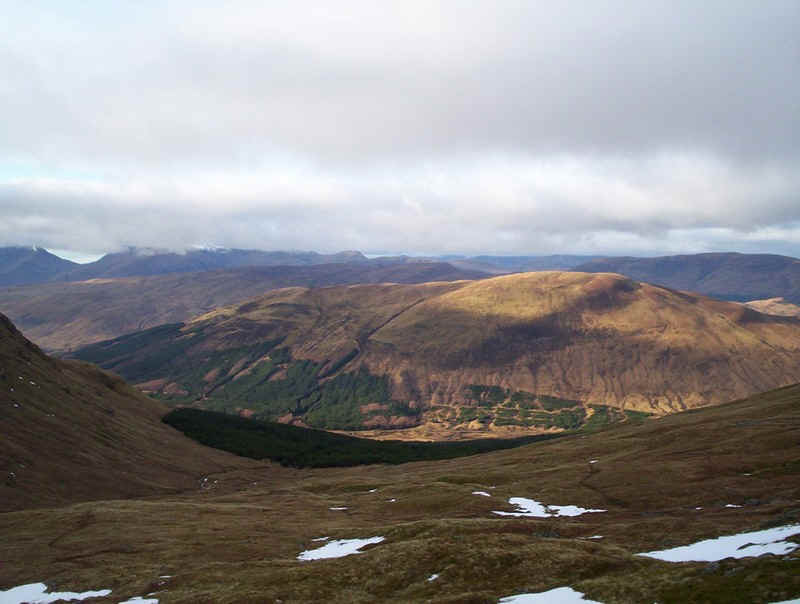 However, on my visit to Tyndrum, about five years ago, I'd managed to climb Beinn Dubhcraig, Ben Oss and Ben Lui, but had run out of time to complete the round of four Munros. It was either the mountain or dinner back at Tyndrum, and the food won! 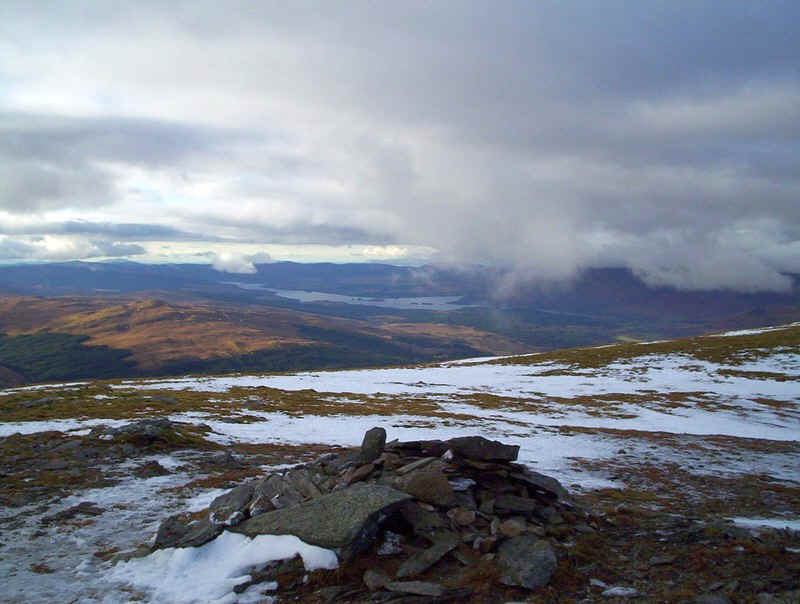 Clearly, there was unfinished business here so, when an opportunity arose for a weekend away in November 2010, I decided to attempt Beinn a'Chleibh from Tyndrum. Of course, a few weeks before it had snowed quite heavily, and I was slightly unsure about whether I would have the time to complete the walk in the daylight hours of late November. 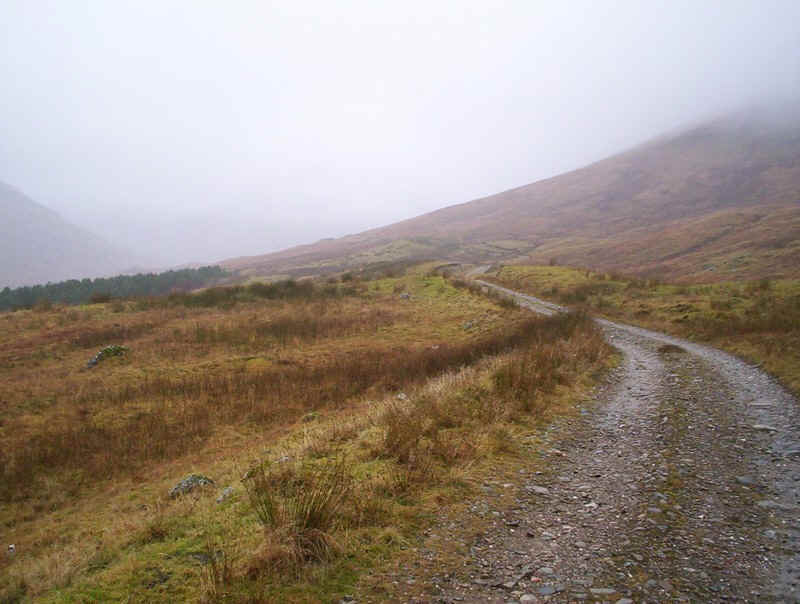 I had a back-up plan of climbing two of the Corbetts in Glen Orchy if the weather got worse but, in the end this wasn't needed. 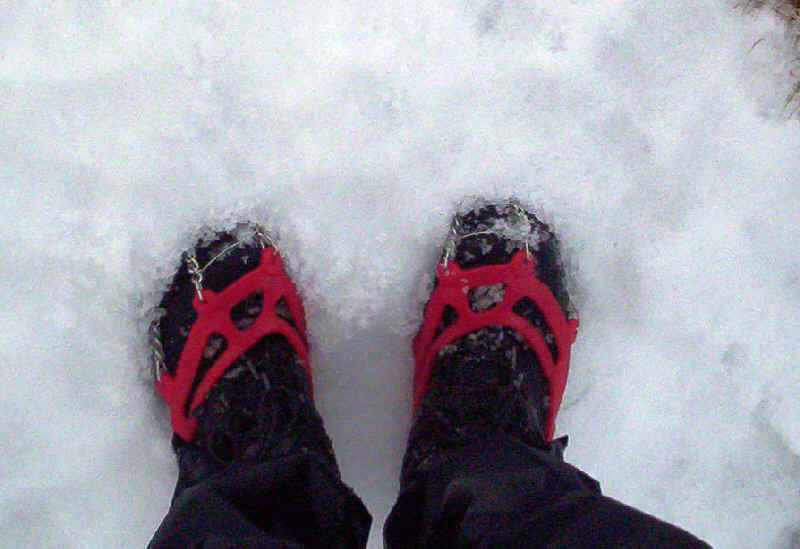 Fortunately, I'd just bought a pair of "Microspikes", in anticipation of some winter walking (on prepared paths) in Switzerland in February 2011. 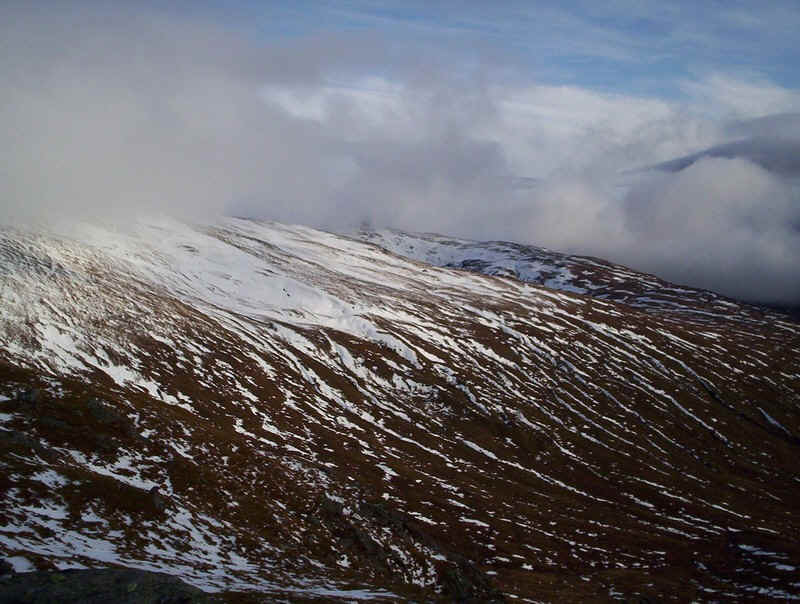 With these I hoped that I'd be able to climb Beinn a'Chleibh, even if there was snow and ice. The weather forecast from MWIS seemed reasonably promising, although it looked as though the walk would have to be done in low cloud with no views but, fortunately, things turned out better than expected. 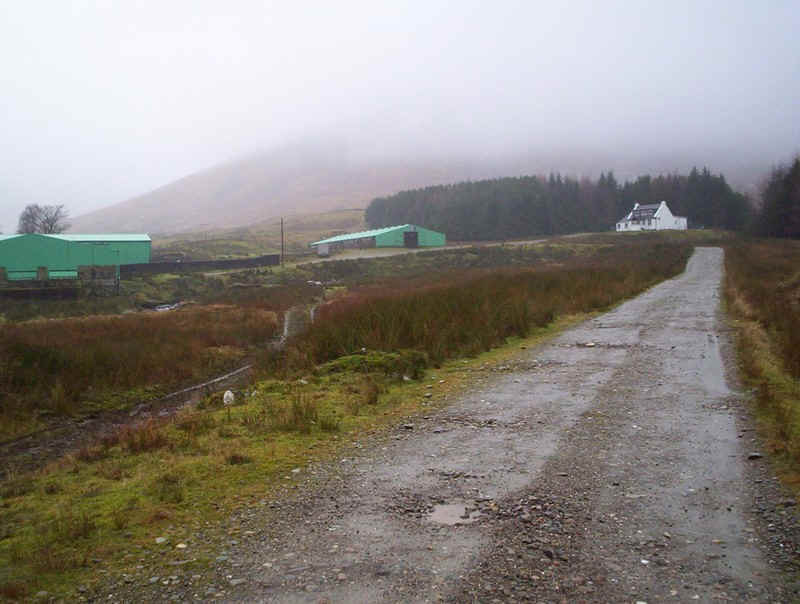 The bright green cattle sheds at Cononish, certainly stand out in the dull conditions. 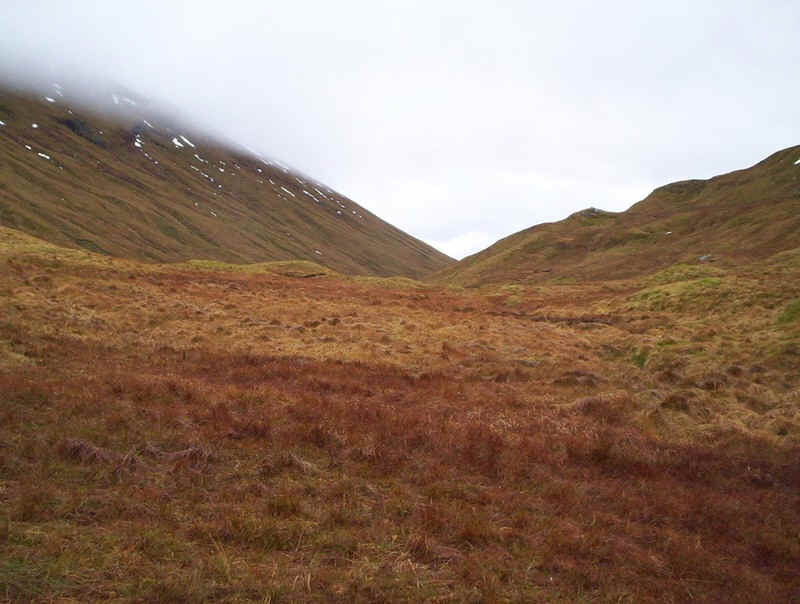 Beyond Cononish, the track rises steadily, and there was not much sign of improving visibility. 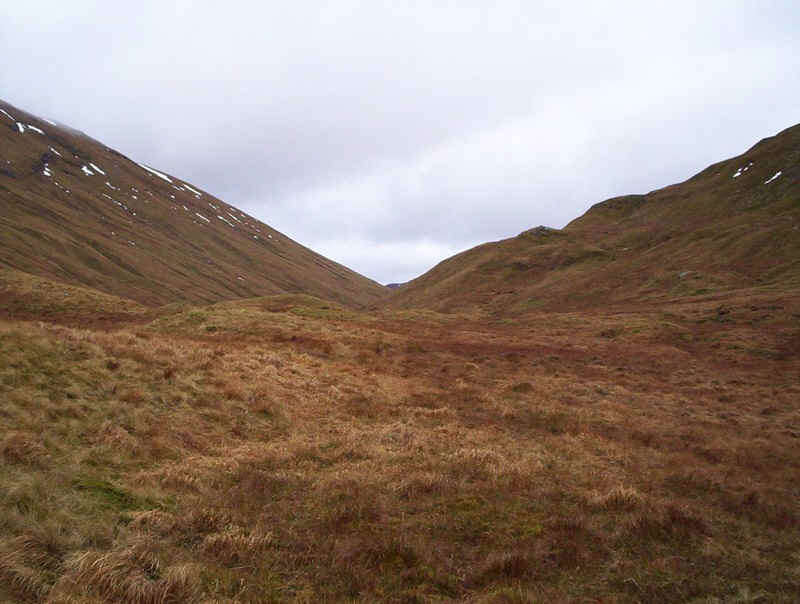 Eventually, the track drops down to the stream of the Allt an Rund, with Ben Lui's lower slopes visible ahead. 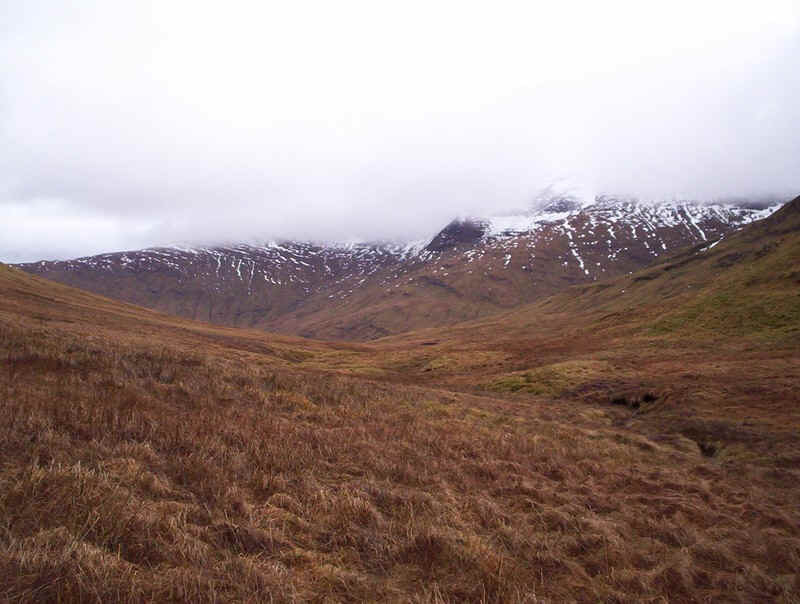 I had intended to walk up the valley to the east (left in this photo) of Ben Lui, by the side of the Allt Coire Laoigh. 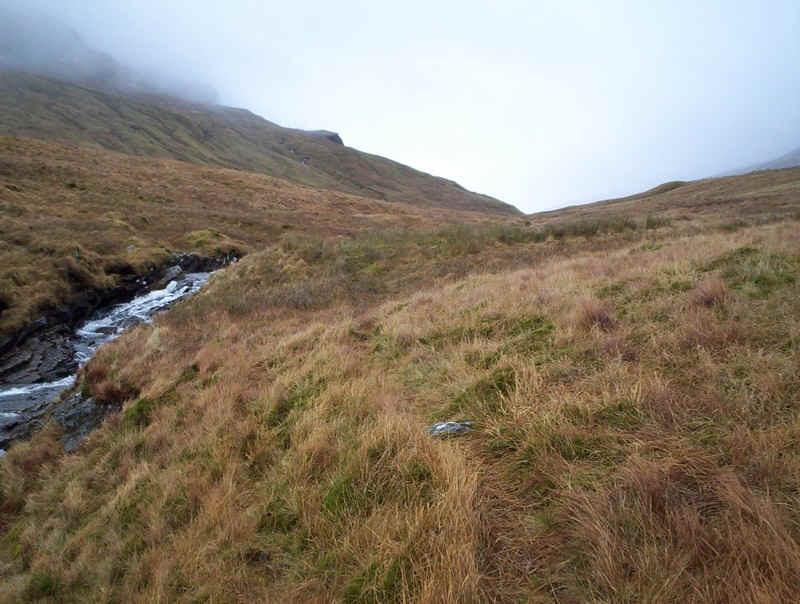 I intended to follow this stream up to Coire Laoigh, and then cut across the south eastern slopes of Ben Lui to reach Beinn a'Chleibh. 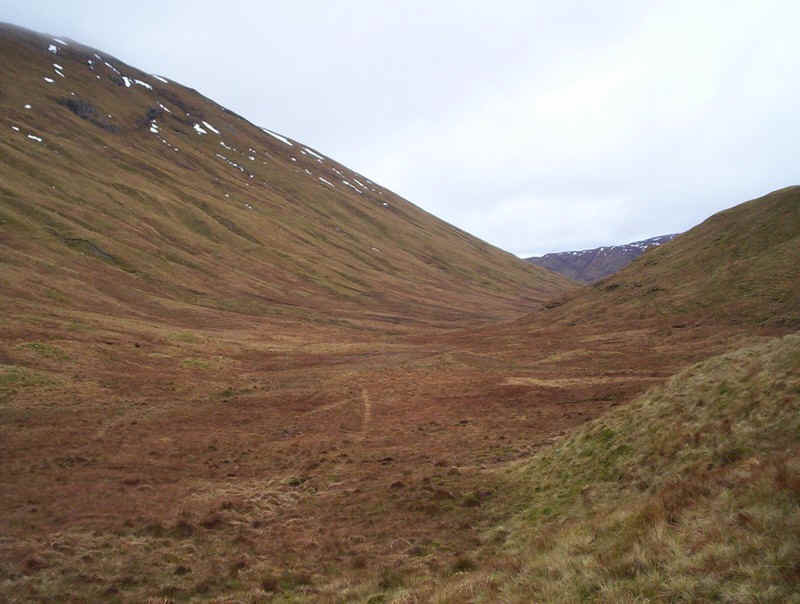 However, the amount of water coming down the Allt Coirean Lochain, which I had to cross, made me decide on a different route; this was to follow the stream uphill and then work around the northern slopes of Ben Lui, to reach the path coming up from Glen Lochy. 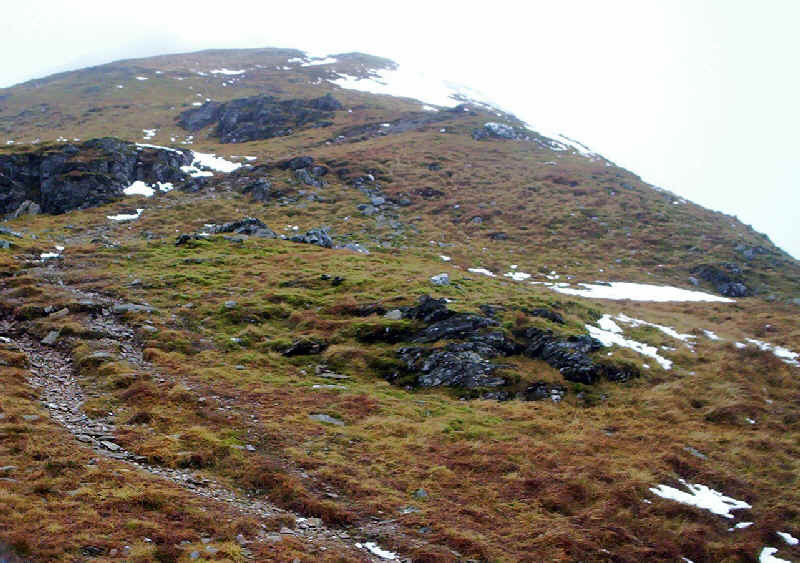 This would then take me up onto the saddle between Ben Lui and Beinn a'Chleibh. 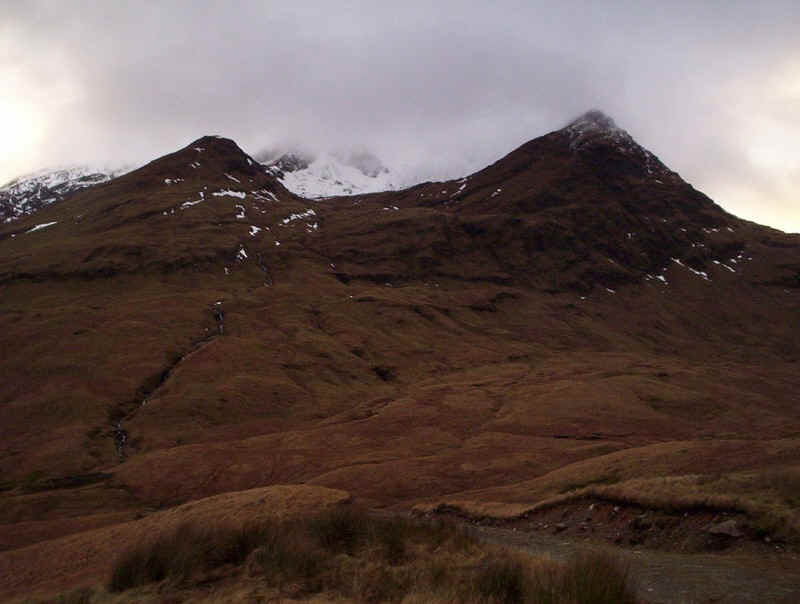 .....although it's intermittent, and leads towards this obvious pass between Ben Lui (on the left) and Beinn Chuirn (on the right). 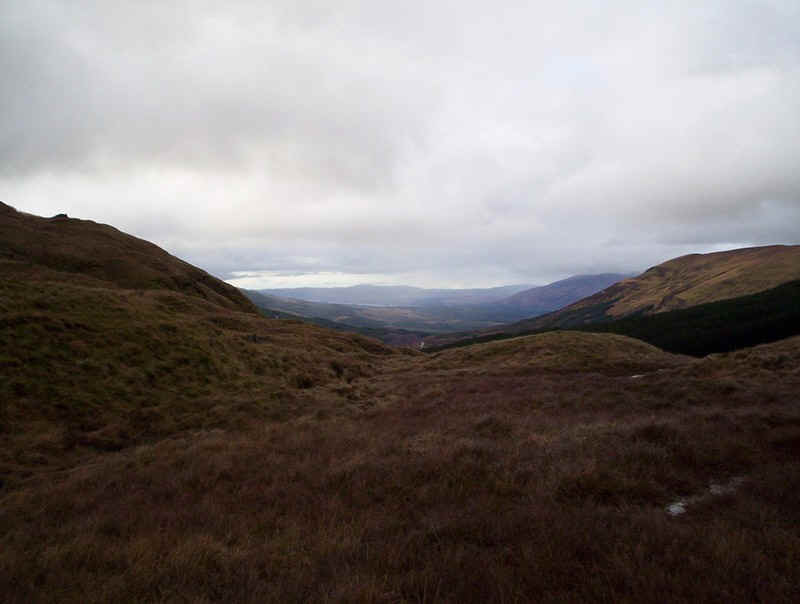 A view opens up at the pass with Loch Awe visible in the distance and cloud covered Ben Cruachan. 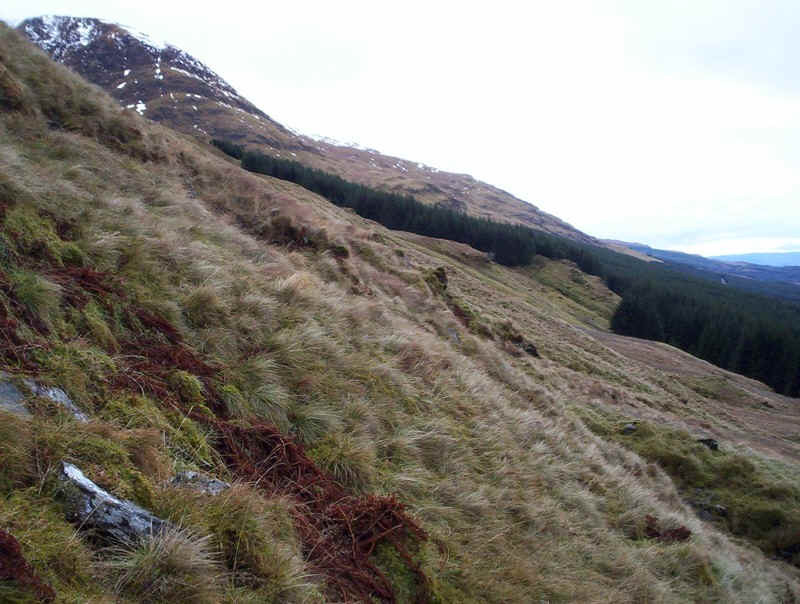 I continued along the northern side of Ben Lui, gradually loosing height towards the forest. 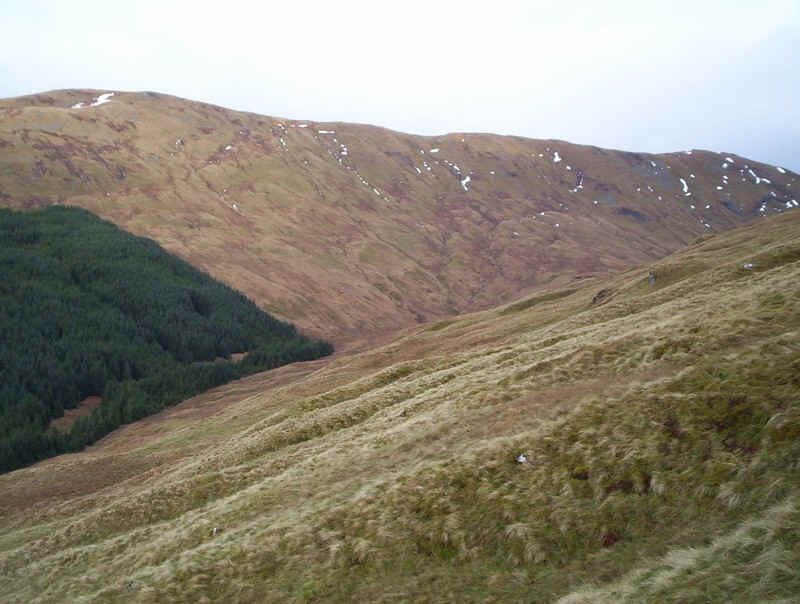 The day's target hill came into view, as I descended slightly towards the plantation. Eventually, as I cut across the hillside, I saw the path that comes up through the forest and joined this just above where it comes across the deer fence. As I got closer, I could see a group crossing the snow to reach the bealach. As soon as I reached the snow on went the "Microspikes" and I was soon on the ridge. 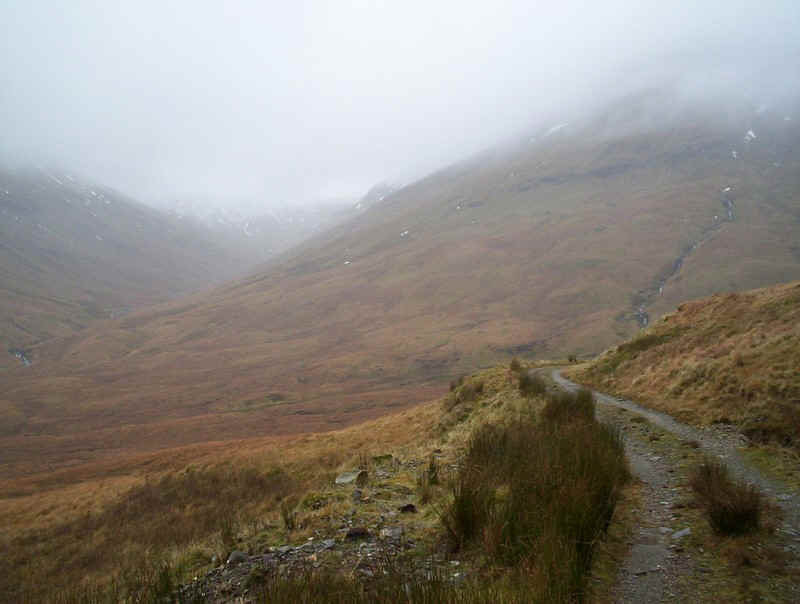 Looking back down into the corrie with cloud still blanketing the Cruachan hills. 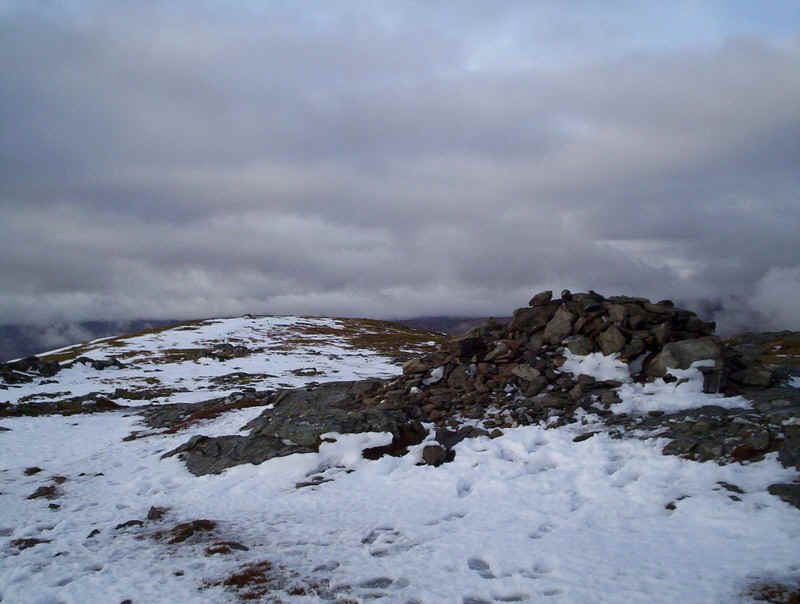 Once at the bealach, too my surprise, there was no snow left on the initial climb to Beinn a'Chleibhn. The makers of "Microspikes" claim that they were suitable for walking on rocks, so I left them on and can vouch for their claims. 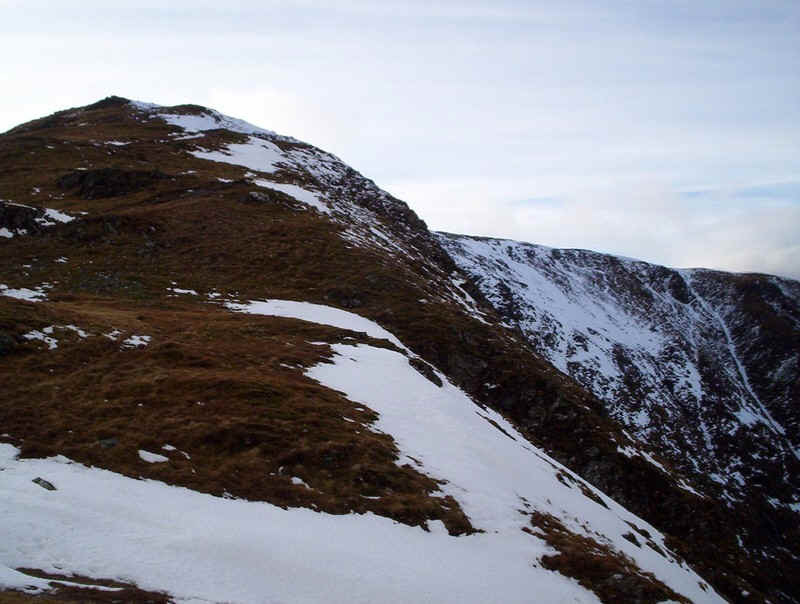 Soon the snow cover increased, although it would have been possible to do most of the climb on grass or rock. However, for me this was a bit of a novelty, as I've never walked in Scotland in the snow before, and never with "crampons" on my boots. 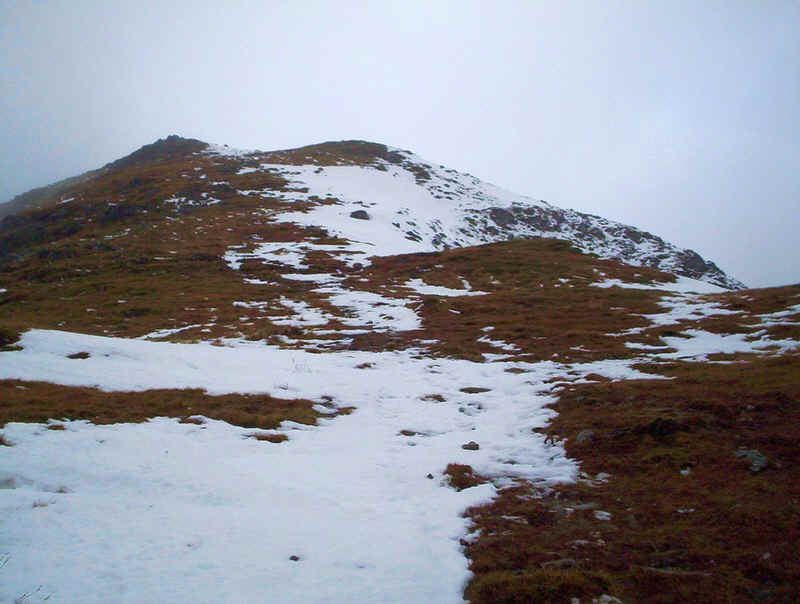 Towards the summit there was a mixture of snow and ice, and I felt able to walk completely normally across this. ....I had actually reached the summit. 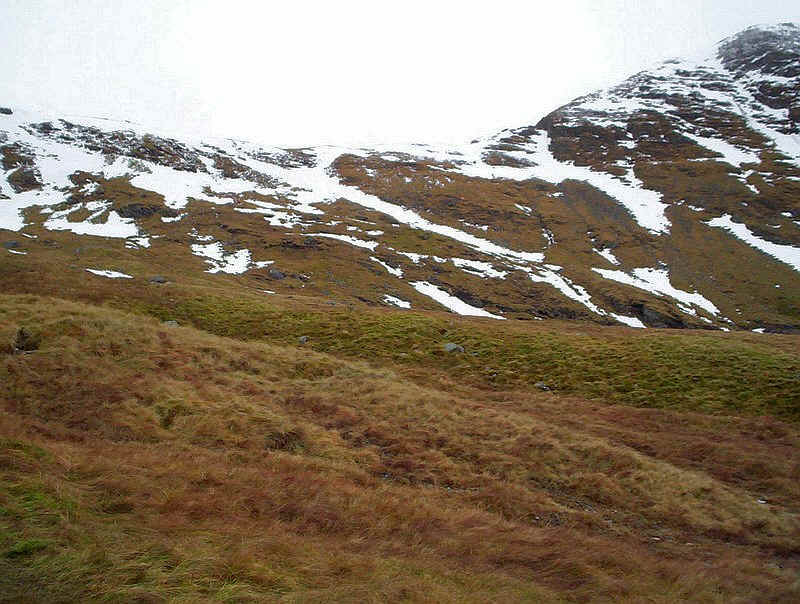 At the far end of the hill, the snow had almost disappeared. Beyond lies Loch Awe and the slopes of Ben Cruachan, just visible in the gap in the clouds. I could see out to Mull and, I think, Colonsay, so the views were far better than I'd expected earlier in the day. 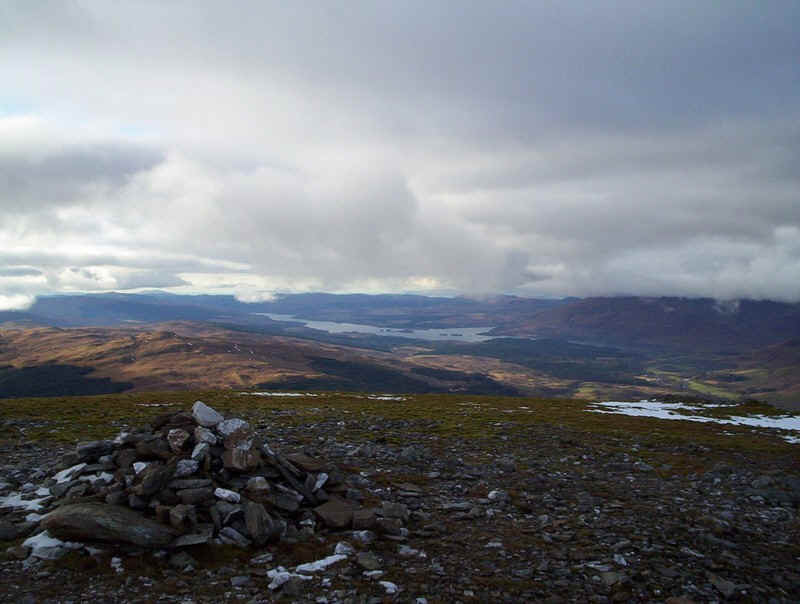 It had taken me exactly four hours from Tyndrum to reach the summit, although some of this time had been spent dithering about which route to take and chatting to a group of walkers. I had a quarter of an hour's break at the top for lunch and a drink, before starting the return walk. 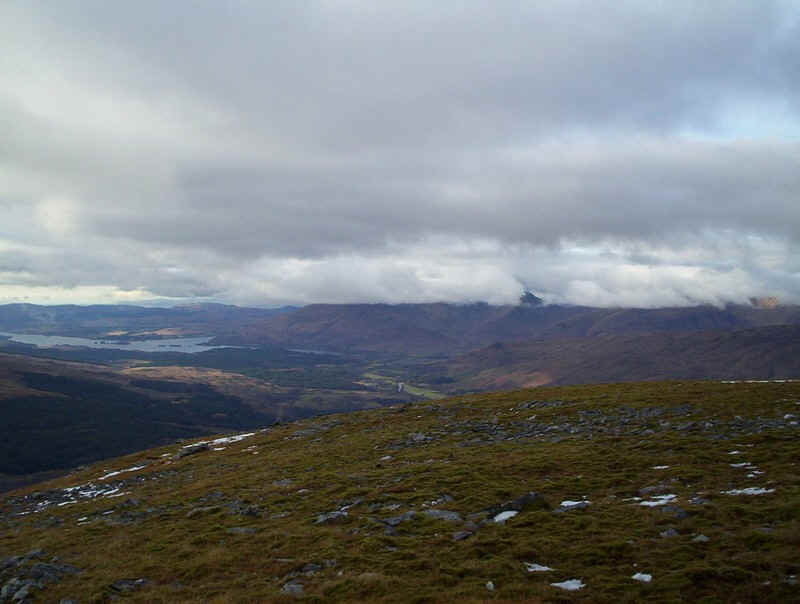 The cloud base was gradually lifting and, eventually, lifted enough to get this view of Ben Lui, on the descent. 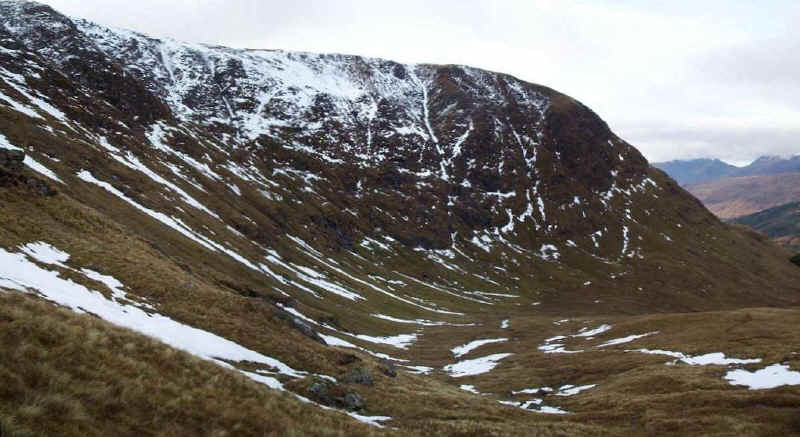 I'd wondered about whether to return via the Coire Laoigh route but, seeing the amount of snow I'd need to cross in the numerous gullies on the south-west face of Ben Lui, I decided to return the way I'd come. 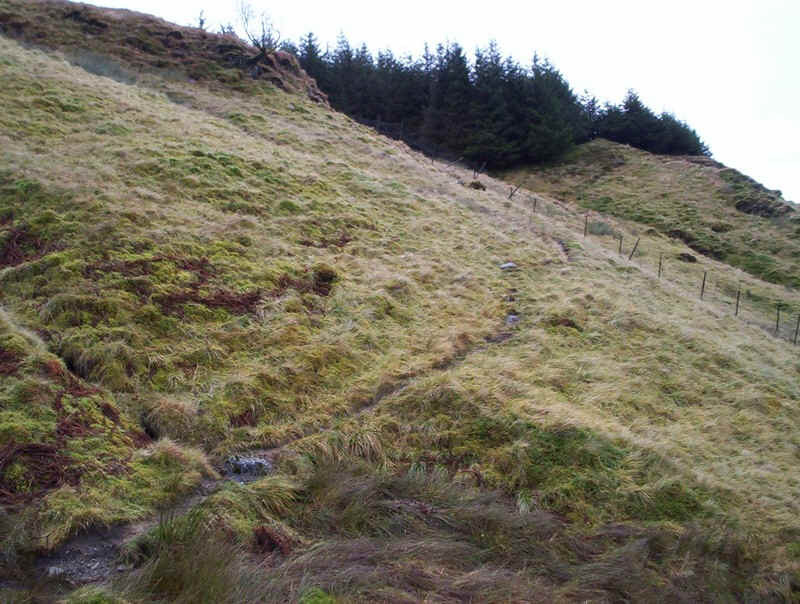 The map below shows the slightly different return route, which avoided dropping down towards the forest. 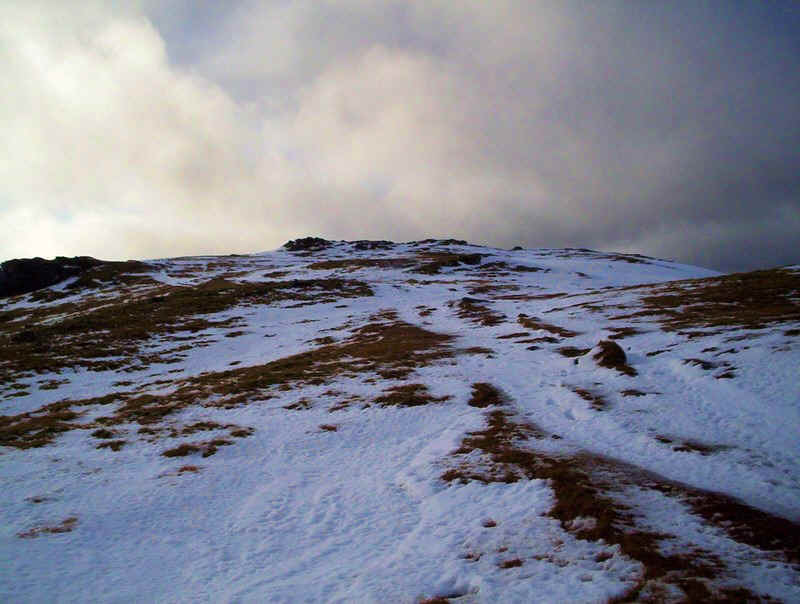 On returning to the bealach, I realised that, what had appeared on the ascent to be a not too steep ascent, now appeared much, much steeper and so it was, that with some slight trepidation, I set off down over the snow. I kicked the "Microspikes" into the snow and found they had a good grip. I took it very slowly indeed down over the snow, making sure that I was firmly placed before moving the next foot. Nevertheless, I've a slight feeling that an ice axe might have been a good idea! The sun kept making attempts to break through the clouds. 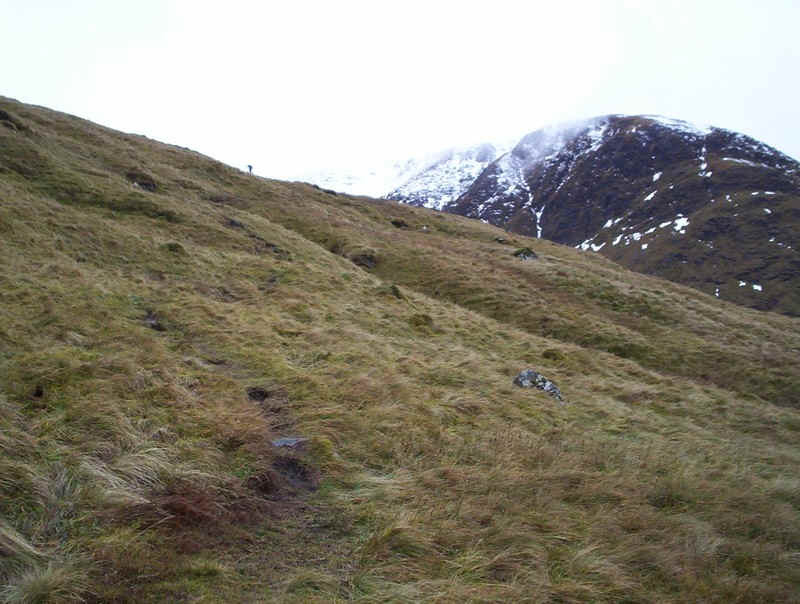 In the distance is the gap between Ben Cruachan and Beinn a'Chochuill. The photo above shows the imposing cliffs of the northern corrie of Beinn a'Chleibh. .....and I was soon at the pass. The ground here was extremely wet and I ended up with both my boots entering the bog on two occasions! 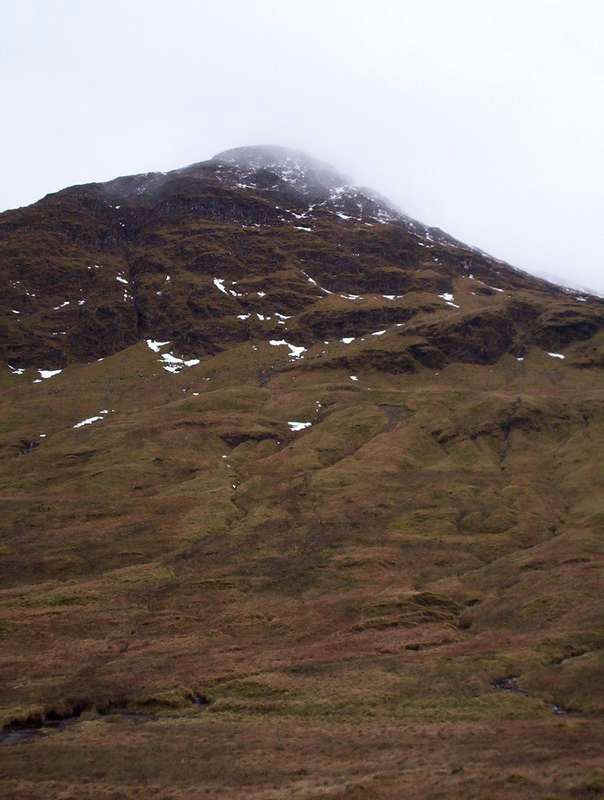 The cliffs of the north eastern ridge of Ben Lui tower above the pass. 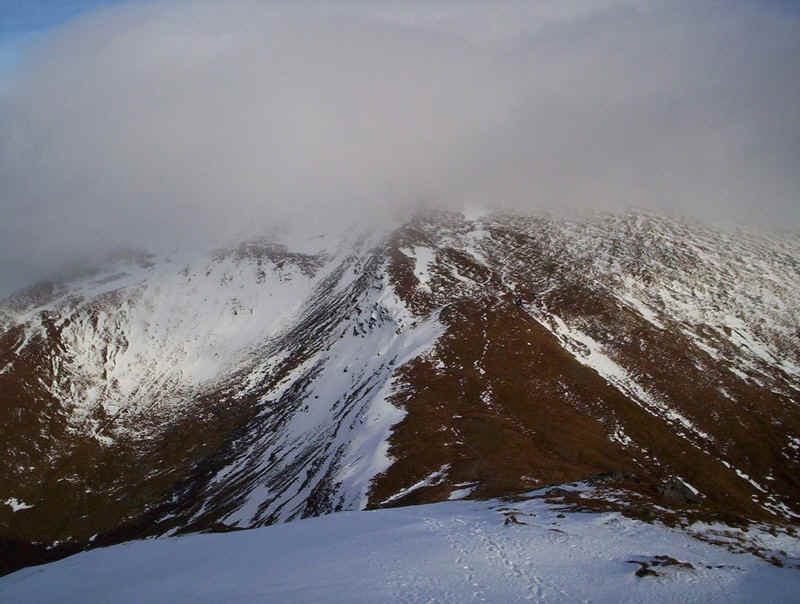 Soon Beinn Dubchraig (to the left) and Ben Oss (on the right) come into view, although the tops are still covered in cloud. 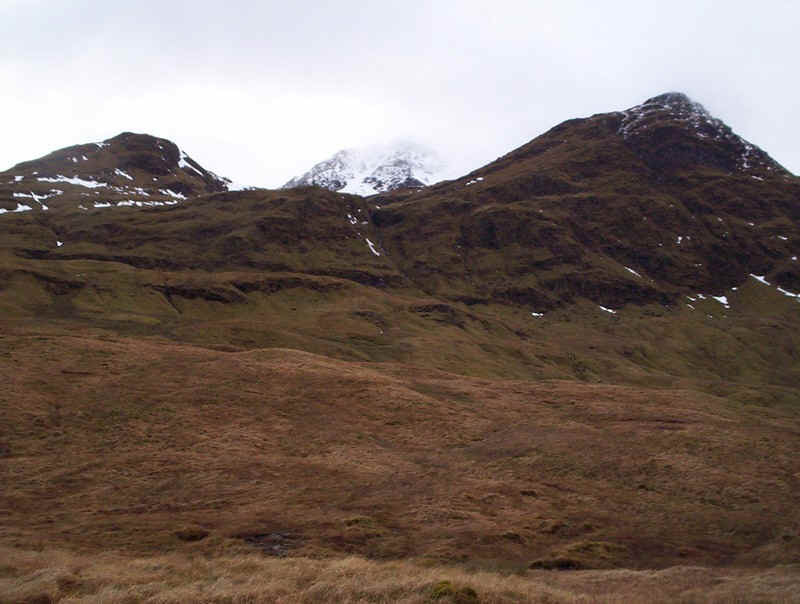 Below are two views of Ben Lui and its enormous corrie. 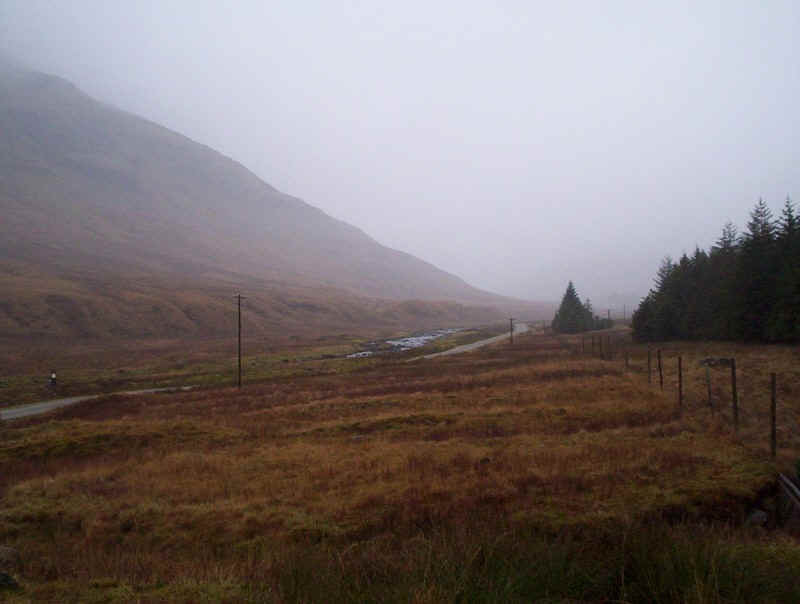 The walk back took slightly less than the outward journey, and I arrived in Tyndrum just as darkness fell at a quarter to five. It was a good day, although I'd have preferred a nice crisp frosty day!